It is a situation that many adults will come across in their lives: they are at a work party or small social gathering and they decide to have a few drinks. Before they know it, it's gotten late and it's time to head home. Maybe they've had quite a few, but the party has gone on for hours and they feel that they're perfectly fine to drive. What's the harm of getting in the car and making a trip that they've made a hundred times before? This line of thinking is common but dangerous. Driving under the influence of alcohol does not only endanger the life of the driver, but of everyone around them. Numerous lives are lost every year to drunk driving accidents, and, unfortunately, there is no indication that this behavior will stop any time soon. While tragic and preventable, all of these accidents have spurred on many researchers who wish to better understand the DUI landscape. One such group of researchers from Aizman Law Firm has compiled and published less commonly known statistics about drunk driving in the U.S. Using data collected from the National Highway Traffic Safety Administration (NHTSA), the researchers found that the frequency of fatal accidents caused by drinking and driving is unsettlingly high. In just one year, there were 7,852 fatal DUI crashes across the country – an average of 22 accidents for every day of the year. These fatal accidents are not only happening in one section of the country. 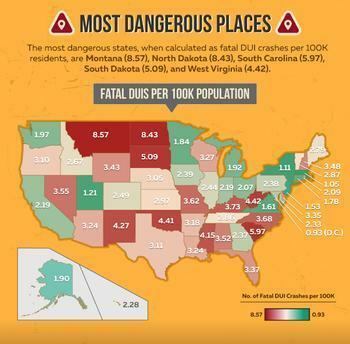 The map provided calculates the number of fatal DUI accidents in each state, using a population of 100,000 people as a baseline. While Montana, North Dakota, South Carolina, South Dakota, and West Virginia can be considered the most dangerous states in terms of fatal DUI crashes, only Washington D.C. has a score of under one accident under these parameters. The researchers also investigated at which time of day accidents were most likely to occur. You could probably guess that closing times for most bars would be the most dangerous time to be on the road, and you would be right; statistics show that most fatal accidents occurred between 2:00 a.m. and 3:00 a.m. across the country. However, there are other time periods that are not exactly safe either. The researchers found that 7:00 p.m. was a high-accident period as well, most likely because this is when many bars and restaurants stop serving reduced-price "happy hour" drinks. They also found that there was a spike in accidents around 3:00 p.m., suggesting that lunchtime drinking may also be rising in popularity. 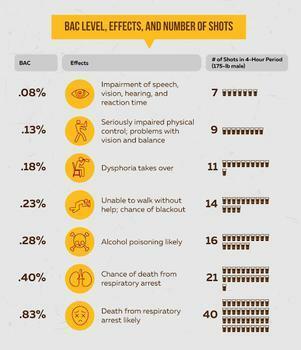 Researchers also looked into blood alcohol content (BAC) numbers to see how they would affect the body and how much a person would have to drink to reach that level of intoxication. The graphic provided shows that seven shots, beers, or standard-sized mixed drinks brings an average adult male to .08% BAC, which is over the legal limit to drive. The effects of drinking more get dramatically more serious as a person's BAC rises. At .13%, a person loses physical control, cannot see, and has trouble controlling their balance; at .28% a person likely has alcohol poisoning, which can be potentially lethal; going higher than that level leaves the drinker at serious risk of respiratory arrest, which will most likely cause death. You may think that drinking so copiously is unheard of, but that is not true. Researchers tracked the highest recorded BAC levels for fatal DUI crashes in each state, and found that the lowest recorded total was .26% – an amount at which many people black out. Completely avoiding drunk driving accidents is nearly impossible since you do not have control of every person around you, but there are ways that you can change your own behaviors to put yourself at less risk. If you are going to an event where there will be drinking involved, be sure to plan ahead so that you and your loved ones can get home safely. The researchers hope that their study will help others recognize that drunk driving is still an issue that requires constant attention. “We may have been hearing about the threats of driving under the influence for many years, but this awareness has been crucial and should continue to be encouraged so the public remains vigilant and outspoken on this issue,” said Milligan. The full study from Aizman Law Firm can be found here.